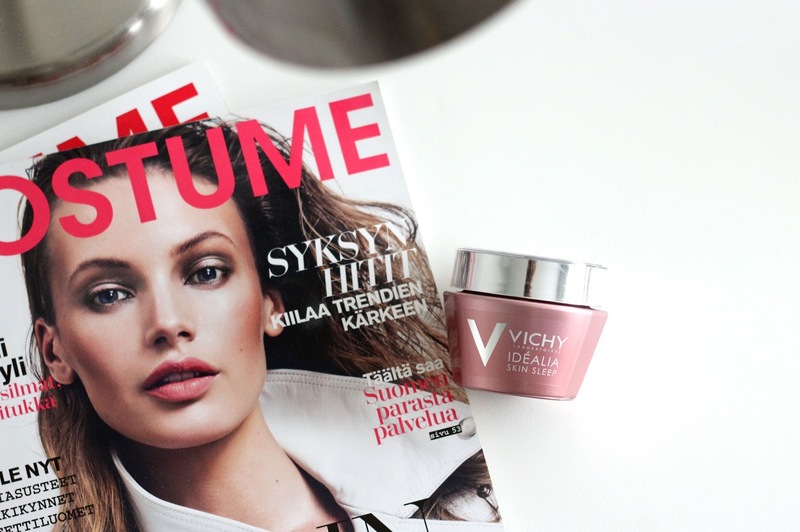 Today I’ll tell you more about one recent discovery that turned out to be my favourite night care so far: Idéalia Skin Sleep by Vichy! You’ve probably heard of the product since it was introduced a couple of months back but I wanted to share with you my experience and opinion as well! According to the brand the cream helps the skin cell regeneration in the nighttime hours in order to wake up with a glowing, ideal skin! Well, in my opinion that’s really close to the truth.. I’ve been using the product for more than two months now and must say that I find it rather impressive! Starting with the overall appearance of the package, it looks and feels really luxurious and the mirrored cap definitely comes in handy when I’m already laying in bed ready to sleep and don’t want to get up to apply the proper night care. As for the product itself, the texture is rich and gel-creamy with a very delicate, appealing scent. Soaks up pretty fast and doesn’t leave a greasy layer. Furthermore, the cream is very economical – as I mentioned I’ve been using it for two months almost every evening and I haven’t even used half of the jar! The most impressive part however is in the morning though: when I wash my face, it feels slippery, which means that even 7-8 hours the product is still present on the skin! Moreover, my skin feels refreshed and soft with less visible marks or dark spots. I’ve noticed that the dark circles under my eyes have faded significantly and overall my skintone has been evened to a greater extent. The product claims to also have an anti-age effect for first wrinkles and lines but I cannot really say if that’s really true since I still haven’t faced those issues. Overall, I must say that this product is one of the few that has really convinced me in its effectiveness and true results. I truly recommend to try it out for yourself since in has had great influence on my skin without causing any irritations or problems (parabenfree, dermatologically tested!). Now I’m really thinking of trying out some other product from the Idéalia range, would you recommend one? This looks like a great product, great review!